If a baby is born small and thin, you would want to feed it so it would catch up to a more normal size, right? An infant is a small, brainless git who has to be toilet trained and fed forcibly because it does not know how much food it needs, right? A child who looks short compared to class-mates is not getting enough to eat, and must be force-fed to enable proper growth, right? Well, if you asked mothers and grandmothers these questions 70 years ago, the answer would be a disdainful ‘yes, of course’, and the pediatricians then would have wholeheartedly agreed. But we live and learn, and we learnt how wrong we all were! Today, the answer to the questions above is a resounding NO, but many people still don’t know it. So, it needs lots of dinning into peoples’ heads that a small thin baby who is force-fed into rapid weight gain is at very high risk for obesity, diabetes, high blood pressure, high blood lipid levels, heart disease (collectively called the ‘metabolic syndrome’), and polycystic ovarian disease in girls. That an infant actually has a pretty good idea of how much food it needs, so when an otherwise well baby resists feeding, or spits/ vomits out food, respect the refusal. That a slowly growing child force-fed a high fat diet (‘give him buffalo milk, chocolates and chocolate mixtures, ice cream and pooris and jam sandwiches and pizzas’) may actually get very poor nutrition, which further hampers growth. How did we discover our mistakes? Pioneers such as Professor David Barker and his team at Southampton found out that babies born small (low birth weight) were much more prone to have hypertension, type 2 diabetes and coronary heart disease as adults. A huge amount of research has gone into the Barker hypothesis, now called the ‘developmental origins of health and disease’ (DOHAD). Professor Shanti Ghosh, Head of Pediatrics at Safdarjung Hospital in Delhi, insisted that the cut off for low birth weight for western or African countries (2500 gm) could not be the same for India, where 2000 gm made more sense. Professor SK Bhargava, who worked with her and later took over as Head, Pediatrics, in Safdarjung, showed that babies who had rapid ‘catch up growth’ after being born thin (‘small for date’) were at high risk for metabolic syndrome in adulthood. This crucial data emerged from the ‘New Delhi Birth Cohort’ (NDBC), established in 1969 in Lajpat Nagar, which has tracked 8,181 births (the F1 generation) from pre-conception (their parents were F0), over the last five decades, to their children (F2) and grandchildren (F3 generation). This awesome work has given us major insights into health and disease relevant to low- and middle-income countries. So, when I found that Professor Bhargava, whom I have respected from the day I met him in 1977, had put together his life’s work into a book, I was thrilled to be able to review it. 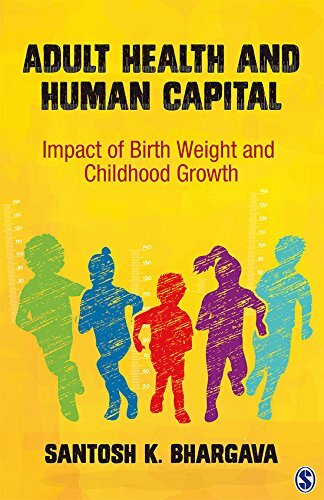 Sure enough, Professor Bhargava’s personality shone throughout the book Adult Health and Human Capital: Impact of Birth Weight and Childhood Growth. He lovingly and candidly describes how the NDBC was set up, the difficulties faced in planning path-breaking work with severe financial and other constraints, how the team succeeded in going into so many thousands of families’ homes and bedrooms over the decades, how the NDBC was later revived, and how it proved to be such a lodestone of information. The easy writing style is rather like your favourite uncle telling you a fascinating story, but it effectively highlights how to plan complex field studies—the pitfalls, the solutions. It should be essential reading for everyone planning an epidemiologic study, or even a long term clinical study. We now take facilities like communication, instrumentation, data storage and transmission, for granted: it was not always so easy, and these pioneers spent a lot of time and intellectual capital to establish what now seems so self-evident. We forget the cliché Jaan hai toh jahan hai: ‘if we have health, we have the world’. Technology cannot compensate for an unhealthy population. The lessons gleaned from the NDBC are critical for health planners and policy makers, who hold the future of the country in their hands. Low birth weight occurs more often when the mother is younger, less educated, anaemic, has lesser access to clean toilets (‘Swachh Bharat’, anyone? ), and lesser access to antenatal care. Babies born preterm do not do so well later. The vast majority of babies are born just one week preterm— even that week’s prolongation of pregnancy works wonders for the baby. What stands out is that simple low-cost interventions can achieve so much—teenage pregnancies avoided, clean houses and toilets available, and better antenatal care given can change demographics. Optimal nutrition in the womb, and then ‘the first 1,000 days’ is critical for human development. Weight and length at birth were found strongly associated with adult height and, interestingly, income. Higher birth weight and better weight gain in the first 2 years of life was associated with longer and better schooling. Babies born small, and then thrust into the current high-calorie-low-activity world, are at risk of being saddled with diabetes and hypertension even in their 20s and 30s, i.e., the prime of their productive life, and of being killed or crippled by heart attacks or strokes in their 40s and 50s. In other words, disease and death can destroy the advantage the demographic dividend can give us. While Professor Bhargava has written a book with his heart and soul, combined with his brain, he has not been so lucky with the editorial support. Typos abound, e.g. a glaring example on page 41: ‘At the first contact in the 25,708 ever-married women, 16,130 (2.7%) were non-pregnant and reproductively active.’ It should have read 62.7%. Typos such as this one were apparent. Worryingly, others would not be. Where the data printed is simply wrong, or contradictory to data or statements elsewhere in the book, the reader has no way of knowing what is correct. In a book which is number and data based, such errors fatally undermine the core arguments, injuring the credibility of the research. In addition to errors, the book contains several repetitions (the chapters appear to have been written at different points of time, and have not been melded together properly) and the language is awkward in places. Things one would forgive a scientist, but not his publication team. The Sage team needs to get its act together and urgently bring out a revised, much cleaned up second edition, if this valuable text is to deliver its full import and wisdom. It would be a pity if the message of this important body of work is diluted due to poor editing. Anju Virmani trained in AIIMS (MBBS, pediatrics and endocrinology), and is a senior consultant with Max, Pentamed & Rainbow Hospitals in Delhi. She is Advisor to the Indian Society for Pediatric & Adolescent Endocrinology; President, ISPAD 2018 and Member of the Editorial Boards of the prestigious journals Pediatric Disbetes and Indian Pediatrics.